Megan Newton, Food & Whine: "I love this particular waffle batter recipe, because you make it the night before, so that in the morning you have batter ready to go. 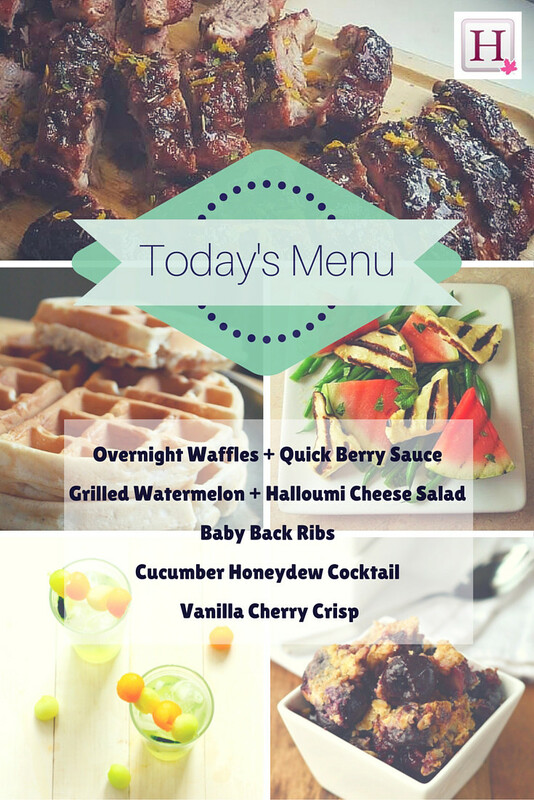 All I need to do is heat up the waffle iron and in a few minutes we have perfect waffles." Get the recipe here. Jennifer Hodge, Clockwatching Tart: "Here's a beautiful way to celebrate summer! Grilled slices of watermelon and halloumi cheese over lemony green beans." Get the recipe here. Angela Amati, Ciao Down: "[These ribs] are crispy and flavorful, yet moist and tender. The glaze is a perfect balance of sweet and savory with a hint of spice." Get the recipe here. Taylor Stinson and Nathalie Sehgal, The Girls On Bloor: "We decided to make a cool, refreshing and light cocktail that's perfect for the end of summer. Our Cucumber Honeydew Cocktail goes well with rum, vodka or gin!" Get the recipe here. Angie Wright, Friday is Cake Night: "The hardest thing about this recipe is waiting for it to cool long enough before digging in!" Get the recipe here.